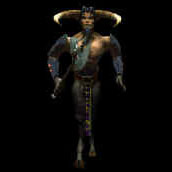 Daedra Lords, like Daedra Counts, can be very dangerous in combat. Their continuous damage spells are particularly deadly and their melee attacks are nearly as strong as the Daedra Counts', so it is best to try to attack from a distance. They are quite intelligent as well and may be willing to give you information, but are likely to attack you once the conversation ends. Come, manling. We hear you are quite the tough little thing. Our Lord says you shall not pass. Would you yield? Good. Our orders are to kill you if you won't yield. Admirably simple and straightforward. So. Don't make me chase you about please. Just stand here and die like a good little rabbit. This page was last modified on 19 August 2018, at 05:33.